From glazed morning buns to Instagram-famous cruffins, San Francisco’s bakeries are in a category of their own. Spread throughout the city from the vibrant Mission to the fog-filled Inner Richmond, locals are spoiled with artisanal bakeries all around the city. The telltale sign is a whiff of freshly baked sourdough bread or the scent of buttery almond croissants minutes out of the oven. The downside is that since news travels fast in this food-obsessed town there will be a line, but trust us it’s worth the wait. The trick is to make sure to get there early, because bakeries do sell out quickly. Come join us on a carb-centric tour of the city, as we scope out some of San Francisco’s best bakeries. ⇒ Visiting San Francisco and want to know where to find all the best things the city has to offer? Check out our Shortcut Travel Guide for more. You might also like 10 Popular Things to Do in San Francisco. If there’s one bakery you need to try in San Francisco, this is it. Yes, it’s worth the hype. There’s no sign outside on the black exterior, but the line winding out of Tartine is enough to know you’re in the right spot. Waiting patiently has its rewards in the form of almond croissants, banana crème tarts and morning buns if you get there early enough. Depending on the time of day, there’s always something delicious to get, from their morning pastries, to their hot pressed sandwiches around lunchtime, and their freshly baked bread in the late afternoon. There’s limited seating inside, but you can always head to Dolores Park a few blocks away for a picnic with a panoramic view of the city. This uber trendy bakery is where the beloved cruffins (croissants baked in the style of muffins) were created and the entire store is Instagram-ready, including the famous “I Got Baked In San Francisco” sign. You have probably virtually drooled over Mr Holmes Bakehouse’s matcha croissants or their flavor-of-the-day cruffins with flavors like blood orange or mango cheesecake. Try to come early, since there’s a limited number of cruffins that are sold daily and they usually sell out quickly. 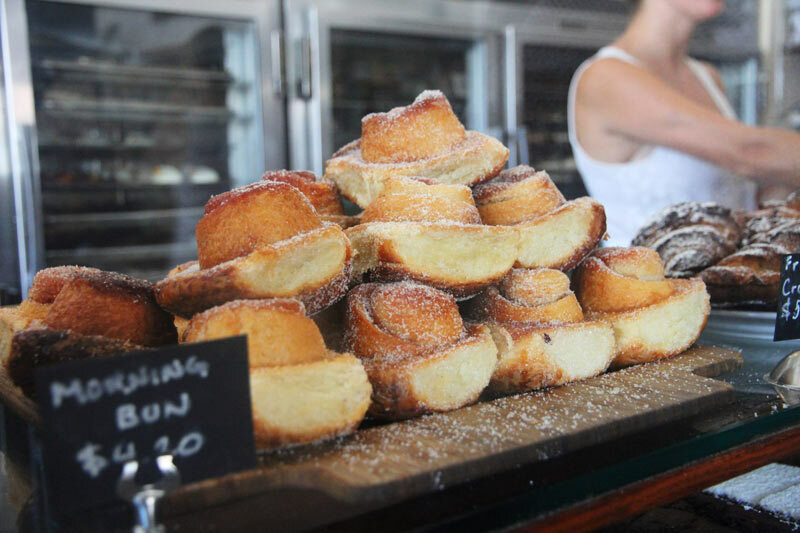 There are also other classic treats like cream-filled doughnuts and buttery kouign amanns. This Inner Richmond bakery makes a wide range of delicious baked goods, but at the top of the list is their irresistibly flakey croissant. Arsicault Bakery quickly became famous after Bon Appetit named it the best bakery in the country a few years back. There’s the ham and cheese croissant for fans of savory and the almond version for those who have a sweet tooth. Like all things in this city, the early bird gets the worm (or in this case the warm croissant). With a beautifully crafted selection of both savory and sweet baked goods, this patisserie is a great place to treat yourself to something fancy. The pastries at Craftsman and Wolves seem like a piece of art almost too good to eat. If you’re looking for something substantial (read protein), get the popular Rebel Within that is a soft-boiled egg baked into a savory muffin. For dessert, the choices are not easy, but try Yuzu Stone, that is filled with coffee crème combined with the tartness of yuzu fruit for a treat that’s not overwhelmingly sweet. There are three branches in the Mission, Bayview, and at the Ferry Building on Saturdays. Do not let the casual atmosphere and the self-serve set-up fool you, since this worker-owned bakery has been holding its own since 1997. Grab a slice from their rotating daily pizza menu, with toppings like kalamata olives, rosemary oil, and herbed ricotta. For baked goods, there are savory focaccia breads and daily scones in flavors like raspberry peach. If you go early enough make sure to get one of their pecan rolls that are worth a trip in of themselves. There’s not a lot of seating, but you can always head to Golden Gate Park a few blocks away if the weather is nice. There are two branches: one in the Inner Sunset and the other in the Mission. Head out to the foggy Richmond neighborhood, where you can indulge in an array of savory and sweet treats at a reasonable price. Cinderella Bakery is know for their delicious baked or fried beef piroshkis that can serve as a meal in themselves or a Siberian-style pies with mushrooms and clear noodles baked between a flaky crust. For a sweet treat, grab a buttery hamentashan cookie filled with cherry filling or a slice of multi-layered honey cake. If you want to go all out and have a sit-down feast, there are a variety of classical Russian comfort foods like pelmeni (dumplings) and borsch soup that do not dissapoint. 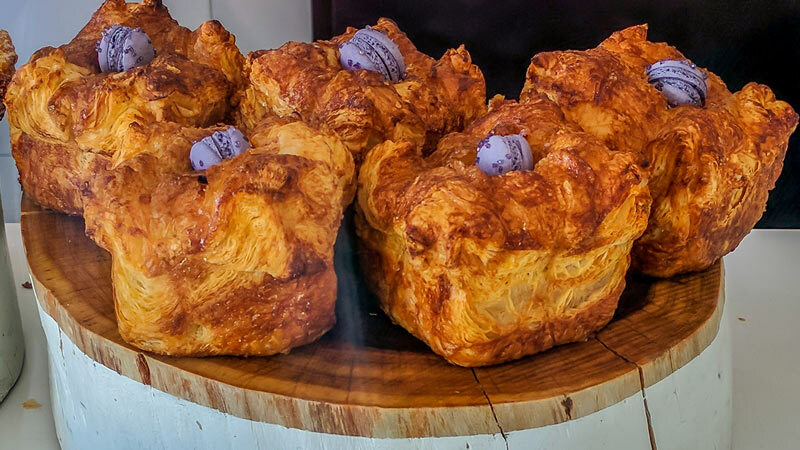 To continue on a decadent French pastry kick, this neighborhood favorite serves up flaky almond croissants (get it toasted), buttery kouign amanns, and sea salt chocolate chip cookies. If you want something heartier, La Boulangerie serves savory turkey and brie or ham and cheese croissant sandwiches that satisfy. For caffeine, the cappuccino served in a bowl will give you the jolt you need. The friendly staff completes the whole pleasant experience, making you wish you had a spot just like it in your neighborhood. A solid bakery in Dogpatch that serves up innovative treats like the ginger pull-apart bread, or the raspberry violet twice-baked pastry. For savory choices, Neighbor Bakehouse’s everything croissant (imagine everything bagel seasoning on the outside) with cream cheese is worth checking out, as well as the ham and cheese morning bun. The interior is tiny, but there is outdoor seating, which is pup-friendly. If you’re into sourdough bread, this is the place to go for freshly baked loaves. Inspired by Eastern Europe cafes and cuisine, this cozy spot in Hayes Valley serves up memorable treats like its famed 10-layer Russian honey cake. All the food within 20th Century Café is served on beautiful dishware that looks like it came straight from the Old World, and the interior feels like it could have come right out of old Vienna. Other notable baked goods are the strudel and the dessert pierogi with sour cherry jam and sour cream. For more substantial savory items there are delicious lox bagels, deviled eggs and potato knishes. Make your way to Pacific Heights, to this chic bakery that feels like you have been transported directly to France. Get in line and debate whether you should order the famous b. patisserie banana almond croissant, the chocolate kouign amann or a plain croissant. If you’re a chocolate enthusiast, the large chocolate chip cookies are a must. When you finally get settled into one of the small tables, make sure to take your sweet time and try not to inhale your order. Julia is freelance writer and founder of the California travel blog Small World This Is. Born and raised in San Francisco, she loves eating her way through her beloved Richmond neighborhood. This entry was posted in Food and tagged San Francisco, USA.